Kroger is having a rare sale on organic grass fed beef! 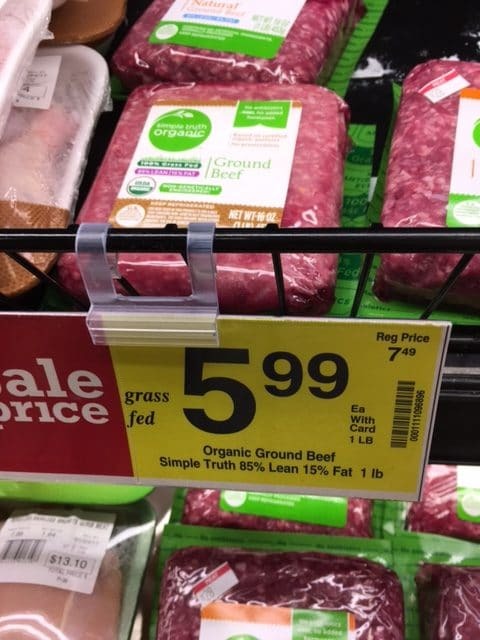 Through 1/24, Kroger is offering Simple Truth organic 100% grass fed ground beef (85/15 lean) for just $5.99 lb! This normally sells for $7.49 lb. Other than Aldi at $5.89 lb. for organic grass fed beef (which hasn’t been in my Aldi for awhile), this is the lowest price seen, so I recommend stocking up! I stocked up! Check your digital Kroger coupons, as there was a Simple Truth beef coupon that you may still have if you haven’t redeemed it yet (no longer available to clip).